Mountain Gorillas are one of the rarest species that have close resemblance with human. The way they physically look, associate and respond are almost inseparable from humans. Scientifically named as gorilla beringei beringei, mountain gorillas are incredible safari attractions inviting thousands of travelers from all parts of the world every day. While in preparation for Rwanda or Uganda gorilla safaris, you require extensive understanding of the basic facts about these gentle giants before confirming your Uganda gorilla safari. Mountain Gorillas share 98% DNA with humans. They are wild apes living in the virugas, part of Volcanoes in the northwest of Rwanda, Virunga Volcanoes of the central part ,Mgahinga in the south west part of Uganda, and a separate national Park – ‘Bwindi national park’ located in the southwestern part of Uganda. If you want to see and interact with mountain gorillas, you must travel to the tropical rain forests of Bwindi impenetrable forest national park and the Virunga conservation area. The Virunga massif comprise of volcanoes national park in Rwanda, Mgahinga gorilla national park in Uganda and Virunga national park in the Democratic Republic of Congo. All travelers must therefore travel to any of these national parks to have a close encounter with these gentle giants in their habitats. There are roughly 880 mountain gorillas in the whole world 480 of which reside in Uganda while the remaining shared by Rwanda and the Democratic Republic of Congo. Just like human beings, mountain gorillas live in families and each gorilla belong to a specific gorilla group, which has a different name. A gorilla group usually comprises of 29 members and each individual has name for easy identification. Every year, Rwanda celebrates gorilla-naming ceremony “Kwita Izina” in which all baby gorillas are given names in their respective families. Before a gorilla family is declared free for trekking, it goes through a training / habituation process which lasts for 2-3 years. Presently, 29 gorilla families have been habituated 13 in Uganda, 10 in Rwanda and 6 in the Democratic Republic of Congo. An adult male gorilla “silverback” is the head of the family and controls the movements of the family as well as defending the family from external attacks. Adult females take care of the young ones and other motherly responsibilities. The silverback has a right to mate with all adult females in the whole family and always fights the growing black bucks discouraging them from accessing the females. Every day, each gorilla family is visited by a group of eight people for an hour except in gorilla habituation experience where travelers spend four hours with the mountain gorillas. Mountain gorillas survive of vegetation as their daily food, which comprise of leaves, buds, shoots, fruits, bedstraw, celery, stinging nettles and flowers among others. The young gorilla babies survive of their mother’s breast-feeding milk rill the age of three after which they start feeding on vegetation just like the grown family members. Unlike other animal species, mountain gorillas do not drink water but only survive on the waters within the vegetation they eat. Mountain gorillas are one of the shyest creatures in the wild, which keep calm and peaceful when not disturbed. The habituated gorillas are free with people in that you can come closer to them and they do not harm you. However, a direct look into the eyes of the gorillas makes them uncomfortable and scared. If threatened, they can be aggressive, beat their chests and roar. That’s why travelers are discourage to keep a seven meter distance from the gorillas and to a void direct eye contact so as to keep the gorillas calm and at peace. Gorillas are one of mans’ closest cousins. Mountain gorillas share over 99.8% of human genes. The human like characters of mountain gorillas where females nurse young babies, which make it fascinating to interact and spend time with the mountain gorillas. The close relativeness make mountain gorillas prone to human diseases like cough and other communicable diseases, a reason why you are encouraged to keep a distance of seven meters away from the gorillas to ensure safety. Conclusively, Mountain Gorillas are fascinating mammals. If you like Mountain Gorillas and desire to learn more about them, visit the Gorillas! 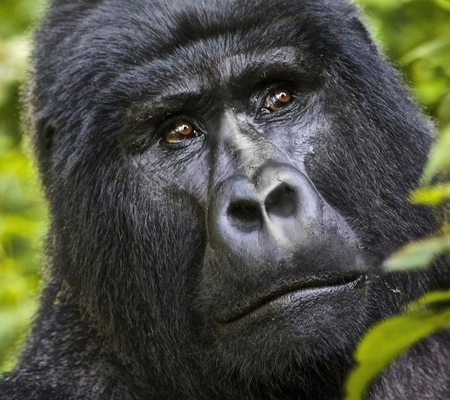 We can help arrange an affordable trip to see Gorillas in Uganda, Rwanda. Customize your gorilla safari here or choose form some of these ready-made Uganda gorilla packages.